Using a real-time surface mapping system, MSK compared intra-fractional movement between a set of patients using an invasive Brown-Roberts-Wells stereotactic frame, and a set of patients using Aktina’s non-invasive PinPoint system with vacuum fixation.The observed motion between the sets of patients was reported to be virtually identical: 0.3 ± 0.2mm. 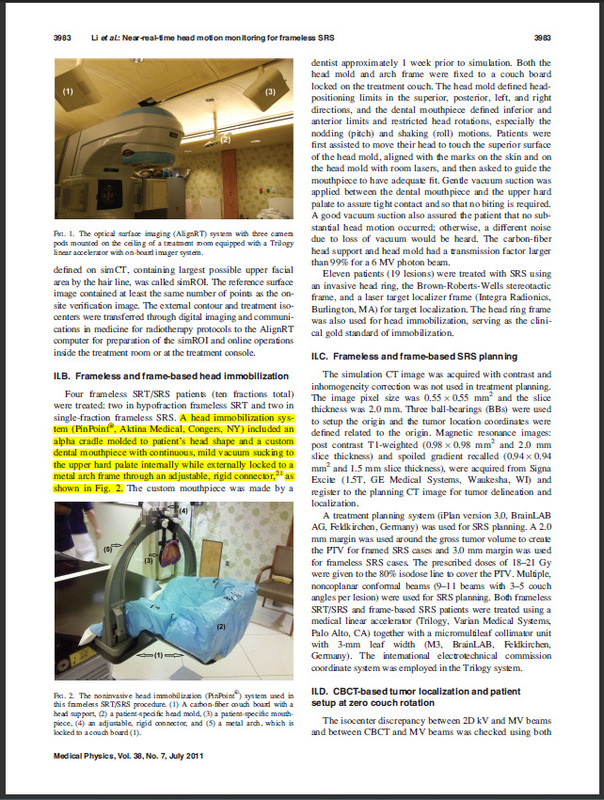 5 N. Ramakrishna, F. Rosca, S. Friesen, E. Tezcanli, P. Zygmanszki, and F. Hacker, “A clinical comparison of patient setup and intra-fraction motion using frame-based radiosurgery versus a frameless image-guided radiosurgery system for intracranial lesions,” Radiother. Oncol. 95, 109–115 (2010). 23 M. Engelsman, S. find owner of a domain J. Rosenthal, S. L. Michaud, J. A. Adams, R. J. Schneider, S. G. Bradley, J. B. Flanz, and H. site down M. Kooy, “Intra- and interfractional patient motion for a variety of immobilization devices,” Med. Phys. 32, 3468–3474 (2005). 24 T. C. Ryken, S. L. Meeks, E. C. Pennington, P. asking for a raise Hitchon, V. Traynelis, N. A. Mayr, F. J. Bova, W. A. Friedman, and J. M. Buatti, “Initial clinical experience with frameless stereotactic radiosurgery: Analysis of accuracy and feasibility,” Int. http://www.aktina.com/news/memorial-sloan-kettering-publishes-pinpoint-clinical-data/J. Radiat. Oncol., Biol., Phys. 51, 1152–1158 (2001).